The InVision team has been busy updating the Craft plugin, a Sketch/PS extension made for UI/UX designers. It offers a bundle of tools including prototyping and quick techniques for duplicating content. 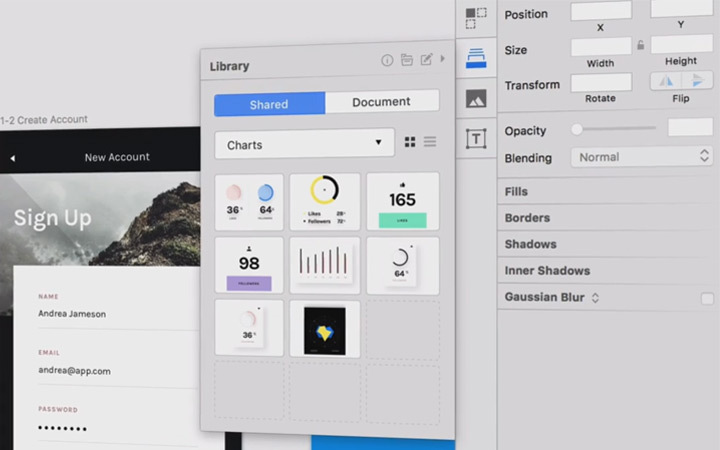 There’s now a brand new Craft feature called Library which syncs a library of design elements to the cloud. Library elements can be anything including text styles, icons, UI elements, or even custom-designed logos. If the library elements get changed then all Sketch documents using the elements will auto-update as well. If you’re working in a team environment this is a crucial tool for organization. Logos tend to change over time, and design specs are always changing on new projects. The Library feature in Craft gives your design team a consistent pool of elements to use without manually updating changes. You have the option to sync content between Dropbox, Box.net, or Google Drive, with other potential cloud options looming on the horizon. Contents are organized by folders to separate elements for different projects. All folders can be accessed from the Library flyout menu which gets installed with the Craft plugin. Also note that while Craft is available for Photoshop and Sketch, the Library feature is only available for Sketch users. It may be expanded to support Photoshop in the near future, but there’s no official confirmation of this from InVision. Either way Library is a big step for digital designers that have trouble with version control and organization inside design mockups. All of these features are created under InVision LABS, a small incubator churning out free resources for designers. Library is just one of many updates we can expect in the coming months. If you’re curious to learn more visit the Craft Library page which has a section explaining the new features. And in the traditional style of InVision’s awesome creative team they put together an introductory video explaining Library and how it might fit into your design workflow.